Awards Highlights: Why is creativity in radio advertising dying? This week was Advertising Week in New York. Attendees of the week-long event got to hear Carolyn Everson, Imran Khan, Wendy Clark or Adam Bain, see the likes of Montell Jordan perform and to experience branded operations by brands such as Getty Images or Spotify. Definitely a must-go event for anyone living in the USA and allergic to south of France beaches. This year, the awards ceremony also included the winners of Clio Music 2016 and Clio Fashion & Beauty 2016. But the winners of the Clio Health 2016 will be announced in a separate event on November 14th. 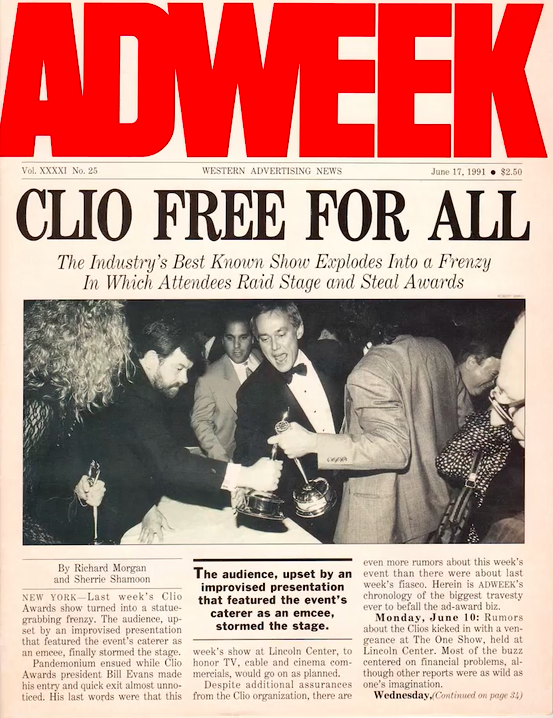 Thanks to a vintage AdWeek cover and a FunnyOrDie online sketch by hosts Megan Mullally and Nick Offerman, we learned that the Clio Awards 1991 awards ceremony was a complete disaster. The London-based D&AD successfully held the first edition of its new awards scheme, D&AD Impact, created in partnership with Advertising Week. The winners of the first edition were solid, which wasn’t a given when you learn that TV chef Jamie Oliver was among the judges. We hear that there will be a second edition, so we are happy to welcome the D&AD Impact among the main awards shows family. After a weeklong of online voting for the the People Choice Awards, the Lovie Awards released their 2016 winners. Needless to say that a lot of the winners had already been crowned earlier this year at sister’s show, the Webby Awards, and some of the winning work didn’t seem too “European”. But, at least, the competition at the Lovie Awards seems less fierce, which allowed entries from smaller organizations to rise among the top. There seems to be a new benchmark in how you should promote your event on social networks nowadays. Apple had already set the mark for its September 2016 reveal of the iPhone 7 by using a custom emoji (#AppleEvent) on Twitter. The AdColor conference, which took place in Boca Raton definitely nailed the social hashtag game. The event partnered with Twitter on a custom emoji (#ADCOLOR). Because it is not enough to see your timeline invaded by numerous tweets about an event that you are not attending, now you also have to see their custom emoji. What’s next ? The IAB Mixx Awards took advantage of Advertising Week to announce its 2016 winners in a ceremony in New York. No surprise in the winners list as the show awarded work that had already won in a lot of previous competitions already. Maybe next year, try to include new people in your jury. That could help. The ANDY Awards has open its 2017 competition. Enter now. The New York Festivals has also open its 2017 competition. Enter now. Story of the Week: Radio anyone? This story came up last week but we had to digest it first. At the Kinsale Sharks 2016, only two pieces of work were awarded a medal in the Radio category, and they only managed to earn Bronze: Starving Artist for Snickers Crisper by BBDO New York and The Gimp for Laundrie by The Public House. Worse than that, no other campaign was shortlisted in the category this year. Which means, that in all the work that was entered at the Kinsale Sharks in Radio, only two was deemed good enough for consideration by the jury. Does it mean that Radio has become an overlooked category or is it an admission of failure by agencies that radio has lost its creativity in the digital age where “Audio doesn’t go viral” ? The sad part here is that advertisers are still using radio as a powerful medium and that agencies are still tasked in coming up with ideas for it. But the industry seems to have collectively decided that there was no longer a place for creativity in there. Oddly enough, the acclaimed campaign The Field Trip To Mars for Lockheed Martin Martin by McCann New York, which was the most awarded single piece of work at the Cannes Lions 2016, won its first Grand Prix of the year at the Clio Awards 2016.